I understand now that what people were meaning when they said D&D was apocalyptic, was just that it requires empires past. So, apocalyptic in the sense that some old cultures had to bite it for us to find their magic items. Which, again, I think is mostly true. But as a child of the eighties, apocalypse makes me think not of looking at Indian petroglyphs, or finding arrowheads (which I've done), but of Mad Max eating dog food because all of civilization has collapsed (which thankfully I haven't had to do yet). 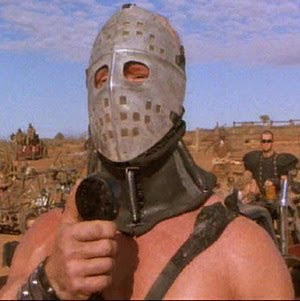 Apocalypse makes me think of Humungus calling out for me to "just walk away . . ." which I know is a death sentence because the only reason he wants in is because there is no better place to walk too. I thought it might be interesting to see what D&D pushed along these lines might be like. I think two causes are most likely for the end of civilization in our campaign world: 1) the Fey Realm returns and 2) the Black Death. In the first the king's castle disappears one evening to be replaced with a dark wood, in the second the king's castle is laid barren by plague until some medieval Humungous takes it up as headquarters. No gnomes, halflings or half-elves. They are gone, dead. No elf player characters, they are not sympathetic with human survival anymore. The Dwarves have vanished deep into the rock. Water is hard to come by, to drink it brings either sickness or magical bewitchment. Food can be hunted but the hunter can quickly become the hunted. Humans live in small roving bands and are constantly worried about infiltration by doppelgangers, and vampires. The woods are full of woses and driads. Gold is useless. Magic items are unstable and dangerous. The most valuable thing is people you can trust. The biggest challenge is to secure a place of safety with food and water. Perhaps there are magic bare lands on the boundaries of the world, perhaps magic doesn't work at high altitudes. Maybe the disease comes in the water and a new continent is the goal. Ruins would only be interesting in the ways they might keep you safe until daybreak. Magic is frowned upon and gods require hierarchies-- only shamans and wild mages exist anymore. What do you think? It certainly doesn't sound like it would feel like D&D in play. Might be fun to try a mini-campaign sometime. Dark Sun meets The Road? yup, dark sun springs to mind. i played it as both dm and player years ago, and enjoyed it very much. so all i can say is... go for it! your ideas sound fun. if you can pull off playing "during the apocalypse" and transforming the original world into the one you just described that would be truly awesome (to me at least :)). i imagine that would require even more work than usual dm'ing though. that's how i always understood "post-apocalypse" as a setting. in the immediate aftermath, not much later. I've wanted to do an apocalyptic setting where the world is invaded en masse by refugees from another planet or plane who faced their own destruction but escaped. They have more advanced magic or technology, seem more intelligent, and have completely foreign politics. Before too long it's the PCs and their ilk who are considered "monsters" by these newcomers, and humanity and its allies are driven into the wilder places to hide and survive among their former enemies as best they can. Great comments, thanks. Dark Sun is tough, but it is really the satus quo, no? Apocalypse is more about horrible change happening before your eyes I think. But yeah, the idea of brutal fight for survival is similar. @Bulette: Being hunted has excitement built in. And would be more dramatic if they were such nice helpful aliens at first . . .